The buzz at Pivot25, a conference for mobile-phone software developers and investors held this June, is all about the future of money. Ben Lyon, the 24-year-old business-development VP of Kopo Kopo, wants $250,000 to produce his app for shops to process payments made by text message. Paul Okwalinga, 28, describes his money app — called M-Shop, it allows you to buy travel tickets and takeout via mobile phone — as “not reinventing the wheel but pimping it.” Kamal Budhabhatti, 35, claims Elma, the latest product from his company Craft Silicon, lets a phone do and be almost anything financial — act like a credit card or an online bank (a “digital wallet,” he says), trade shares or forex, organize a company’s payroll and (incidentally) surf the Web and phone home. Cash suddenly seems very old. The previous week, Joe Mucheru, a senior manager at Google, declared credit cards prehistoric. Adding to the giddy mood is the thought that the inventions on display might make some lucky Pivot25ers gazillionaires. And where are these extraordinary futures being imagined and plotted? The giraffes and zebras grazing in the game park outside rule out Silicon Valley, Seattle and Bangalore. Try Nairobi. 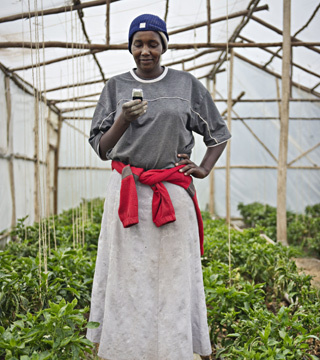 Cell phones have taken all the world forward, but they are positively transforming Africa. Lack of infrastructure — few hospitals, landlines and roads; little power, education or running water; small banks; sparse insurance; tiny stock exchanges — is a large part of what economists mean when they say poverty. And much of Africa is a giant, dark infrastructural void, as anyone who has flown over the continent at night can attest. See pictures of the cell phone’s history. Africans, and Kenyans in particular, are making their presence felt online too. When Kenya erupted in violence in the aftermath of a disputed general election in late 2007, a handful of Nairobi code writers created Ushahidi (meaning testimony in Swahili), a data-mapping platform to collate and locate reports of unrest sent in by the public via text message, e mail and social media. The idea was simply to find out what was happening. Says Ushahidi co-founder Juliana Rotich: “The TV was playing The Sound of Music while we could see houses burning in our neighborhood.” But the desire to know what’s going on turned out to be universal, and Ushahidi quickly became the world’s default platform for mapping crises, disasters and political upheaval. According to Rotich, by May of this year, Ushahidi, which is free to download, had been used 14,000 times in 128 countries to map everything from last year’s earthquake in Haiti to this year’s Japanese tsunami and the Arab Spring. As a result, Internet traffic in Africa is among the fastest growing in the world. “This is a tidal wave of activity crossing the continent,” says Ben White, a blogger and the founder of VC4Africa, which connects African tech entrepreneurs with mentors and financiers. Google says online advertising in 2010 saw 5.2 billion clicks on African sites vs. 3.7 billion in Western Europe. “The pace is amazing. It’s lightning speed,” says Mucheru, who heads Google’s sub-Saharan Africa office. The Web’s economic effect echoes that of mobiles: a 2009 World Bank study found every 10% rise in high-speed connections raises growth by 1.3%. As the most developed country on the continent, South Africa is the obvious hub for online Africa. And yet when Google was looking for a regional base, it went first to Nairobi. Why? Because Kenya — notably its government and specifically Ndemo — embraced the Internet as few other nations have. Unlike other African regulators, who often see protecting state telecom monopolies as their duty, Ndemo was an early and enthusiastic liberalizer of telecoms and fiber networks and was instrumental in Kenya’s decision to lay its own national undersea fiber cable when talks on a regional link failed. Ndemo says the state’s ultimate aim is free mobile calls and e mail for every Kenyan who wants them, which he estimates at 60% to 80% of a population of 40 million. The driving principle behind his digital zeal, says Ndemo, is that “the Internet is a basic human right” and a necessity for economic growth. That prospect is already prompting some repressive governments to pull the plug. In April, during opposition protests against President Yoweri Museveni, Uganda ordered Internet service providers to block access to Facebook and Twitter, where much of the dissent was organized. That month Swaziland also reportedly suspended access to Facebook in the face of protests. In June, Rwanda blocked the Umuvugizi website as a court found its editor guilty of insulting President Paul Kagame. And journalist groups say Sudan and Tanzania, which has a version of WikiLeaks in JamiiForums, use Chinese-style malware to damage user systems and delete content. More-enlightened leaders make the new channels work for them. The eventual winner of Nigeria’s presidential election in April, Goodluck Jonathan, announced his candidacy on Facebook.